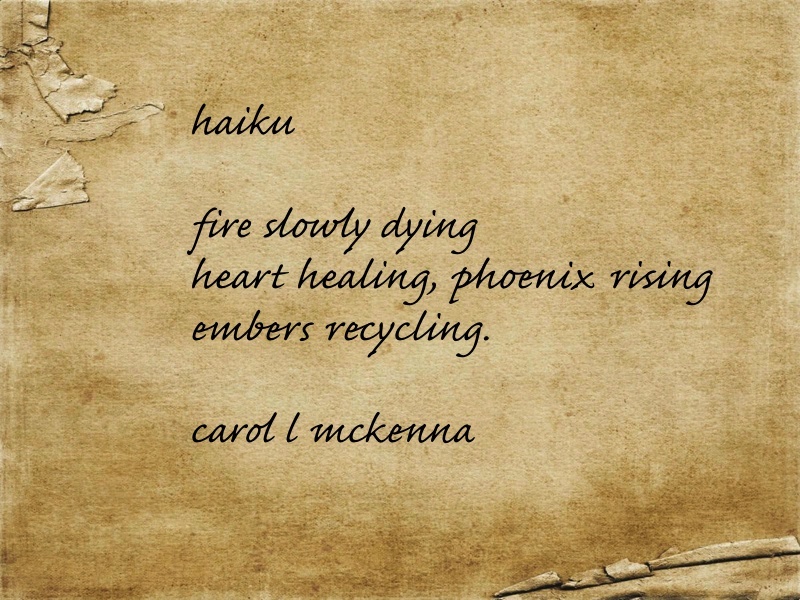 Beautiful post, Carol, and the haiku is fantastic! You bet I have gray days. My muse takes the opportunity to rest. 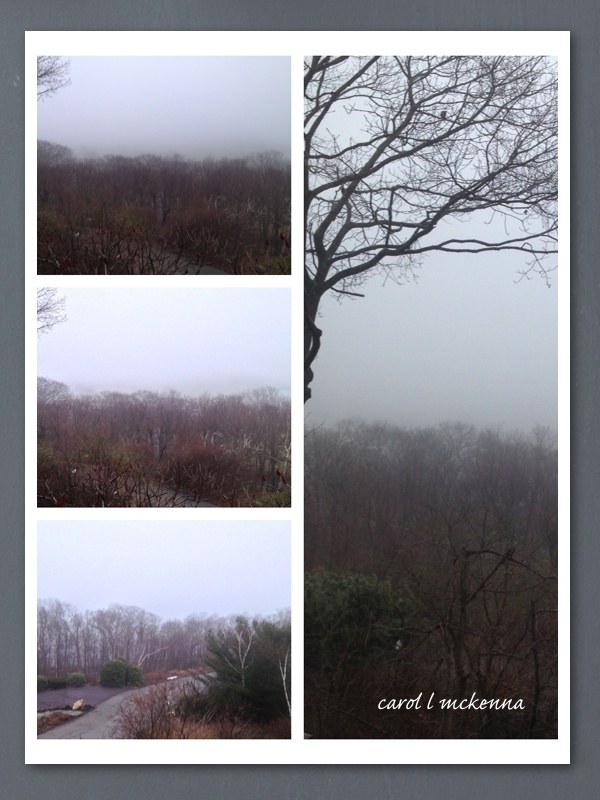 What a lovely collage on a foggy day! Hi Carol!!! lovely photos and the haiku is great!!! hope you have a super inspiring week! The poem is very nice - we seem to look at the embers as dying while forgetting that it was very much life affirming and alve. So much so that it kept us warm for quite awhile...Santa looks very relaxed, as if he is unwinding from a very hectic Christmas past. Great post! Wonderful post! Love the feeling in your photos! The foggy day photos with the brown and grey tones are beautiful. Great shots of a foggy, foggy day, Carol!! Love your mosaic! Hope you have wonderful week! Enjoy! I love the photos and the haikus! Beautiful! Your weather looks like ours. A great haiku! Delightful misty ethereal captures.... I love them. Hope you've bundled up nicely. Moody atmosphere from the first photo. :D Nice RRT pic post, he's yet to be stowed for safe keeping? Love the haiku, I always get pains trying my hand in writing a haiku back in high school. lolz. Great Pics! 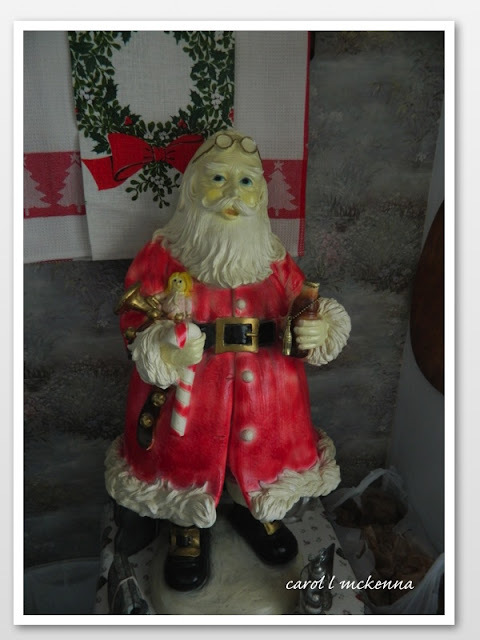 We have has some fog too.Love that wonderful Santa pic!Beautiful Haiku! Beautiful foggy shots and haiku. Been 'enjoying' the same fog for days now! Lovely post! I am having those sort of days right now. It's been so cold and dreary. I just want to sleep and sleep. I love everything about this post. The collage of the outside in fog is especially beautiful! Beautiful haiku Carol (and ArtMuseDog) really a nice one. Rising like a phoenix ... wow! Thank you for sharing this with Carpe Diem. I think the foggy scenes look beautiful. But, I am always happy to see the sun come out. Reading a good book sounds like a great idea. Have a happy week! Of course, during the holiday season, I'm always out and about hunting down a new santa for my collection...LOVE your santa photo share!! Some beautiful, enigmatic foggy scenes in your collage! Adore the quizzical expression on the little Santa's face! And love the idea of "embers recycling" in your haiku! the foggy views are lovely and great haiku as always. Great photos once again And I really love the Santa!!!! Your poetry is always very nice too. The ruby red Father Christmas is already ready for next year, lol ! Love the atmospheric foggy pictures. As creative as ever. Getting the Phoenix from the embers is a very nice touch. Love your haiku--beautiful and restful...Great pics too!